A sitting president of any nation at the end of his term always has stains on his/her presidential uniform and the frequency with which the presidential suit has to be brought to the state-media-dry-cleaning-services may increase when she or he is so bold to want a second term. 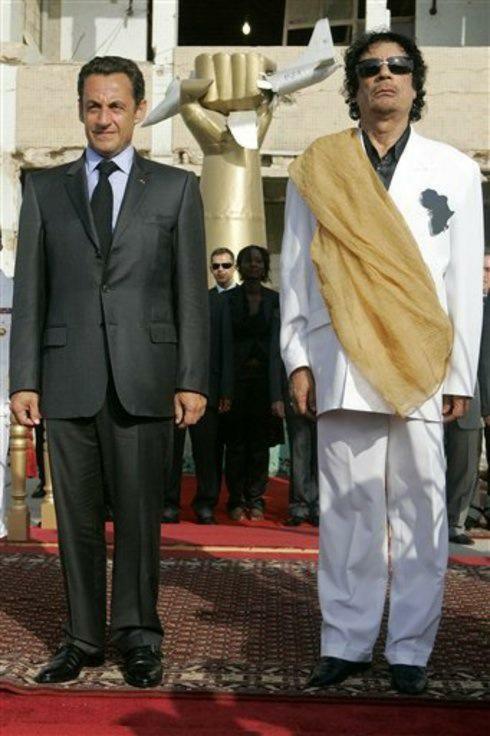 Sarkozy is no exception to this rule and indeed his stains are numerous, some are hard to remove older stains on the shirts he was wearing during earlier stages of his career: Karachi-gate (1994) Bettencourt (2007), La Garde-Tapie (1993-2007), and several stains by ‘the always well documented slander’ of Le Canard Enchainé (like the October 2011 article on how a death sentence of Gaddafi has been instrumented by French Military Intelligence). Last stain thrown at him was by Dominique Strauss Kahn saying his sexual misconduct in New York was manipulated by the French government to keep him from running for President . Yes, the same DSK who is like Sarkozy a master of doing things and than saying he has not done them. There is a method to remove such scandalous stains in one go from the president uniform and that is an old governmental recipe: WAGE WAR! War is is something as glorious as it is dirty and a president that leads a nation into war – even when it is just a small one – will not be judged anymore for his civil stains. A president in the double role of a warrior wears the military stains that come with that exercise like medals of honour on his uniform. 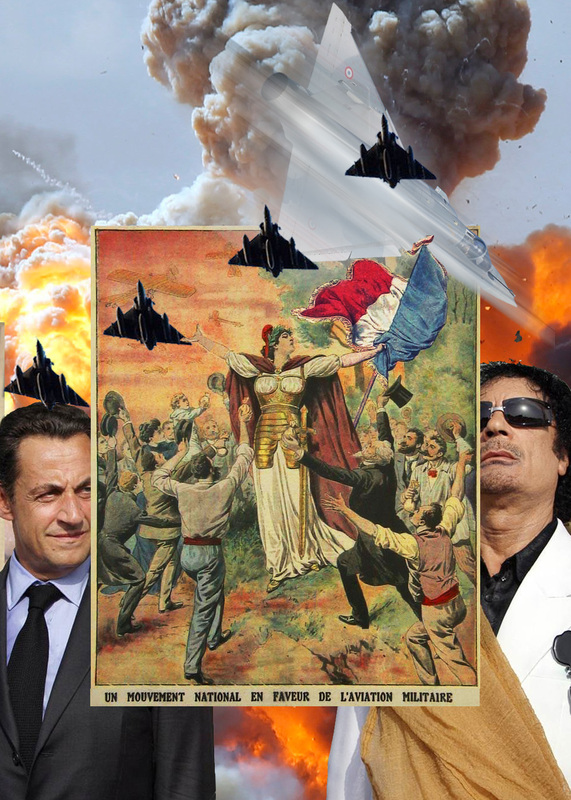 This understanding of the manipulation of the mood of a nation made me write several weeks ago this small article which may have still some informative relevance today, only one week from the final decisive presidential elections in France. Election Marathon for the Presidential Election in France today and how Sarkozy tries to distinguish himself from his opponents… as a world leader taking the lead in liberating an oppressed people and killing the dictator that suppressed them, a man capable of bringing democracy by decisive force. A glorious picture that has more than one layer…. 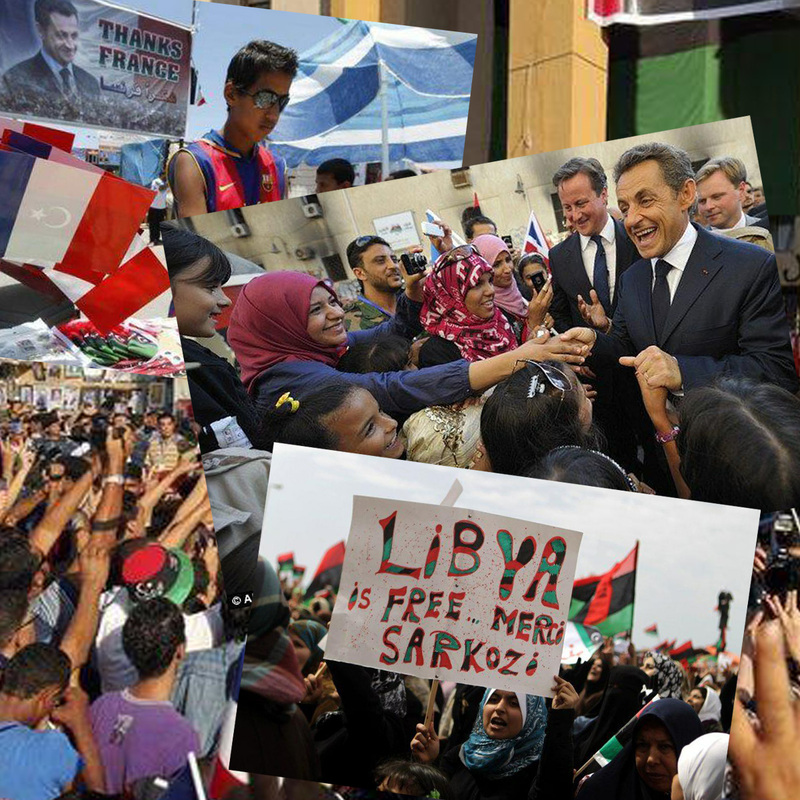 Below some pictures of Sarkozy’s enjoying his greatest moment during a visit to Libya in September 2011. Applauded as the embodiment of the liberating force of France, France of the Great Revolution centuries ago, still bringing liberty, equality and fraternity. 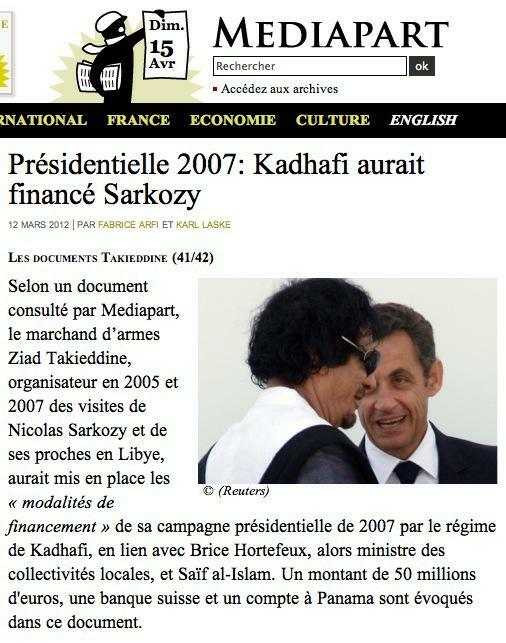 L’Express September 16., 2011: “A Tripoli, Sarkozy savoure sa victoire libyenne” (in Tripoli Sarkozy savours hisLibyan victory). Pictures from both Benghazi and Tripoli. 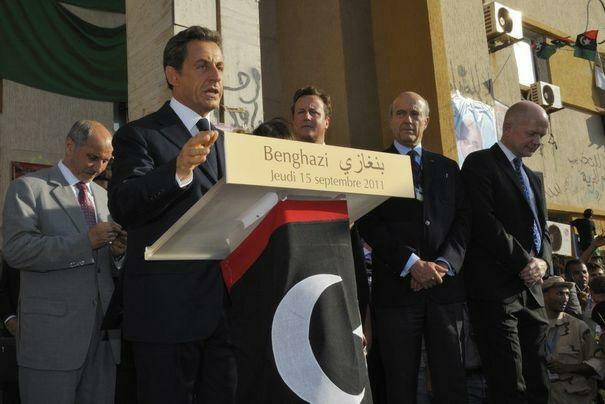 The words of Sarkozy about a needed ‘reconciliation’ were spoken in Benghazi on the 15th of September 2011. It is now one year ago that the revolt against the Gaddafi regime in Libya started and the USA, Canada and its West-European Allies intervened on behalf of anti-Gaddafi insurgents. The step from support of insurgents – who would not have been able themselves to beat the troops of Gaddafi on a short term – with aerial bombardments, to a civil reconciliation process, has been impossible to take. The way in which a regime change takes place also determines what kind of new social structure will appear. There have been over 25.000 air missions by NATO, but, throwing bombs from high in the sky and repairing means not only repairing material devastation on the ground. Repairing the social devastation is an even bigger task. The military victory and the jubilant proclamation of a new order leave the population a weak non-elected self-appointed government in Tripoli, secessionist regions, all sorts of retaliation against all kind of layers in society that have been closely allied with the former regime. How else could it be after a regime that has been busy establishing and keeping its power during four decades. 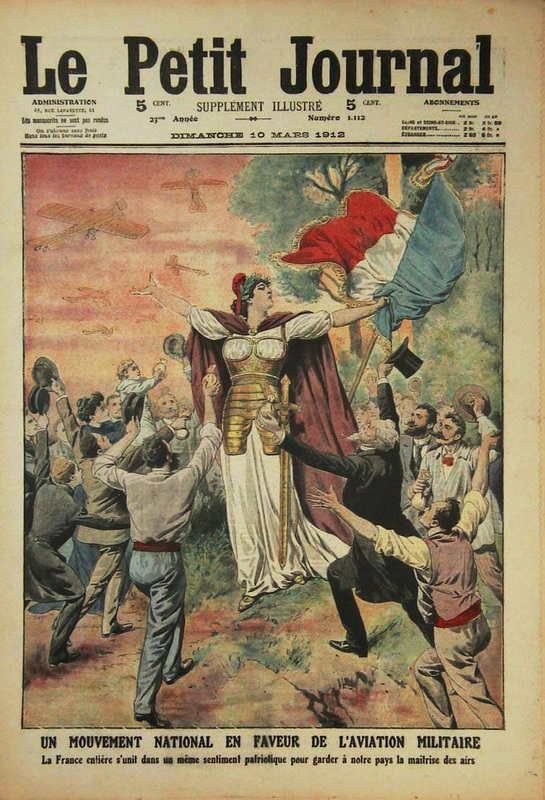 1 – the picture in the centre is from Le Petit Journal exactly one hundred years ago glorifies military aviation in its earliest days. 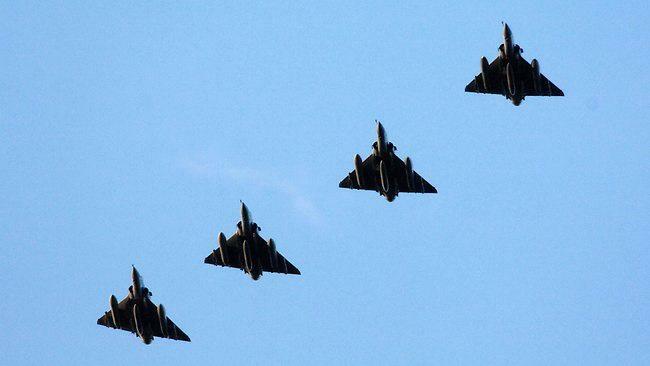 2 – French airplanes returning to their base in Corsica after flying a bombing mission over Libya, article in Los Angeles Times March 21, 2011, taken over by Australian web site. “Gaddafi fervour wanes as bombs hit” is the header of the article. 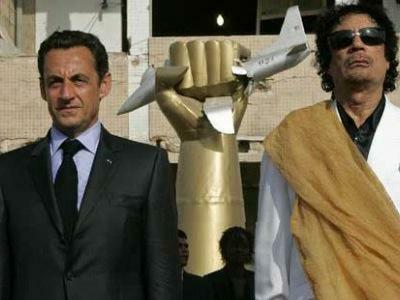 Cropped version of the Michel Euler photograph of Sarkozy’s visit to Gaddafi in 2007. 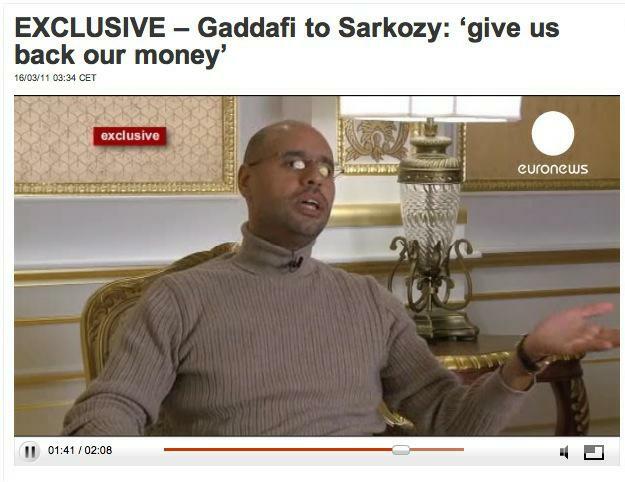 Another bit of news shedding light of the Gaddafi-Sarkozy relationship before the French President choose to attack his former ally, is March 16, 2012, interview with the son of Gaddafi for the Television station of EuroNews. Saif al-Islam did survive until now and has not been silenced yet, though he may use some of his knowledge first of all to protect himself. If he ever will face the International criminal Court in The hague, remains doubtful. 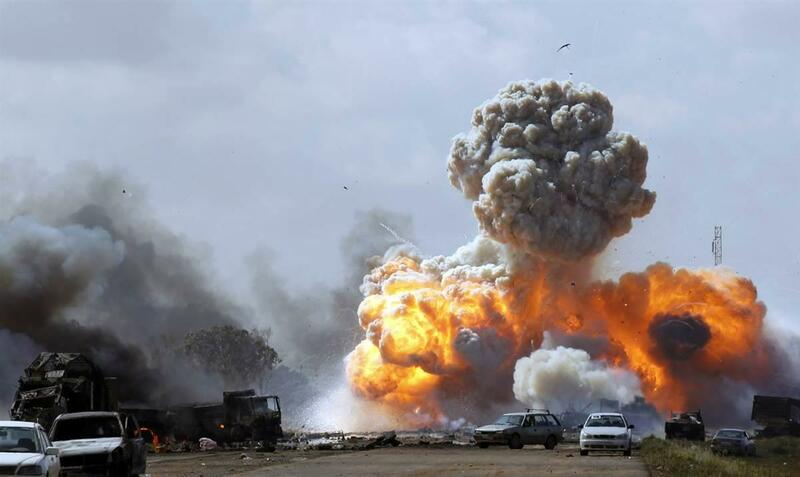 4 – Vehicles belonging to forces loyal to Libyan leader Moammar Gadhafi explode after an air strike by coalition forces along a road between Benghazi and Ajdabiyah, Sunday, March 20. 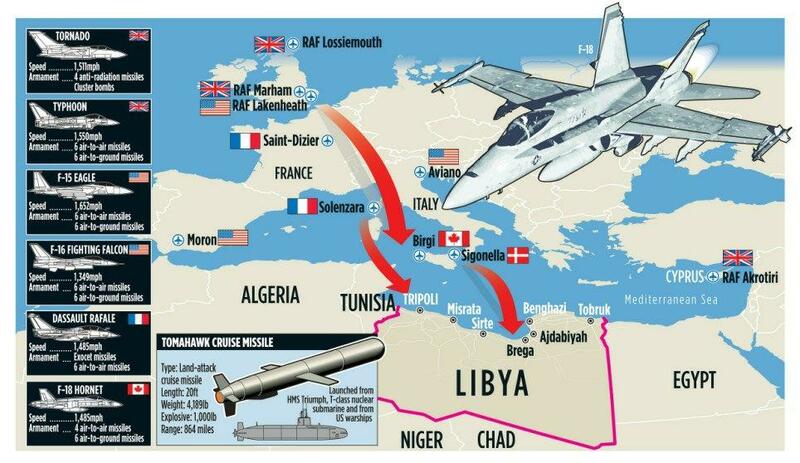 This map that appeared on many web sites shows the French participation in the aerial bombardment in March 2011 of strongholds of the former ally of Sarkozy, Gaddafi.